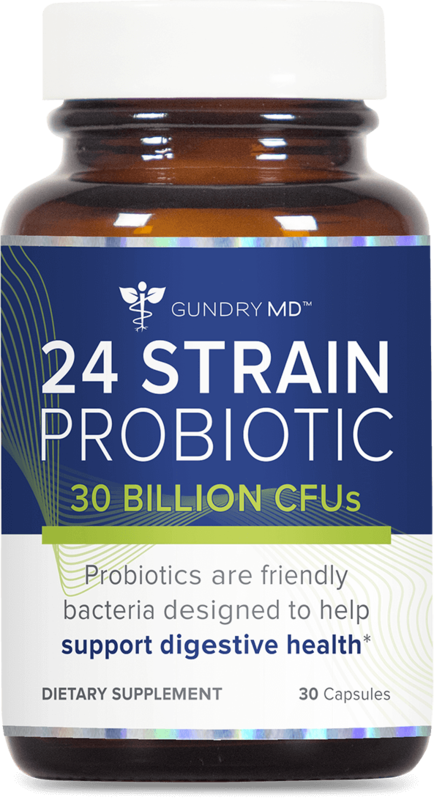 And those are just 4 of the 24 bile-resistant strains in my Gundry MD™ 24 Strain Probiotic… strains designed to target your health right at the source: your gut. For 20 years I've struggled with my skin breaking out around my mouth. The breakout was exacerbated by stress and menopausal hormonal shifts. Within a month of taking the 24 Strain Probiotic my skin has cleared up. I've tried so many different remedies and I'm just so grateful that this product is helping me and my skin. This Probiotic is doing it’s job! Combined with Primal plants or vital red. I have more energy and I feel great . My face looks great and I don’t get sick any more.every year I used to get really sick with cold and every day at work I was so tired. Not anymore. I recommended this to my friends and family and my mom and dad are very happy with Results . Thank you Dr Gundry!! For the price, quality, diverse, excellent bacterial strain choices, and the cfus in the product, this hands down beats all others on the market. My family and I took this product regularly in the first months during and following the plant paradox program. Now that I have been in phase 3 for over a year, my family uses it for maintenance and stress/illness times. We take it if our stomachs are not feeling well (not very often now), when everyone around us is ill with the bug de jour, and when we are traveling to help protect or system. Love this product. I haven't had a regular bm for a long time, now I have one every morning. Normal and am relieved as going 2-3 days wasn't normal, although I didn't tell my Dr. I have always eaten a well balanced diet, and did not take a laxative. So your product is wonderful. My stomach was always bloated and feeeling full all the time. Since taking this probiotic My bloatedness went away.